Motorcycles are back in action, taking away some of the limelight that scooters had been hogging for several years. Scooters, after having grown at a faster pace to motorcycles for eight consecutive years, are lagging behind in growth. The data for the first five months of the 2018 calendar year shows motorcycle sales have grown at over 22 per cent, compared to a growth of about 15 per cent in scooters. In India, the world’s biggest two-wheeler market, motorcycle sales grew at 6.44 per cent in 2017, less than half, compared to the 14 per cent growth in scooters. The last time motorcycles managed to grow faster than scooters was in 2009. However, in the first five months of this calendar year, sales of motorcycles expanded 22.44 per cent to 5.7 million units, Society of Indian Automobile Manufacturers (Siam) data shows. Scooter sales grew at 15.68 per cent to 2.84 million units. These are sales from manufacturers to dealerships. In each of the last four months (February, March, April, and May), the rate of growth for motorcycles has been stronger to scooters. In the last two months of April and May, motorcycles grew at 19.38 and 15.16 per cent, respectively. The comparable number for scooters was 12.63 per cent and a decline of 1.40 per cent. 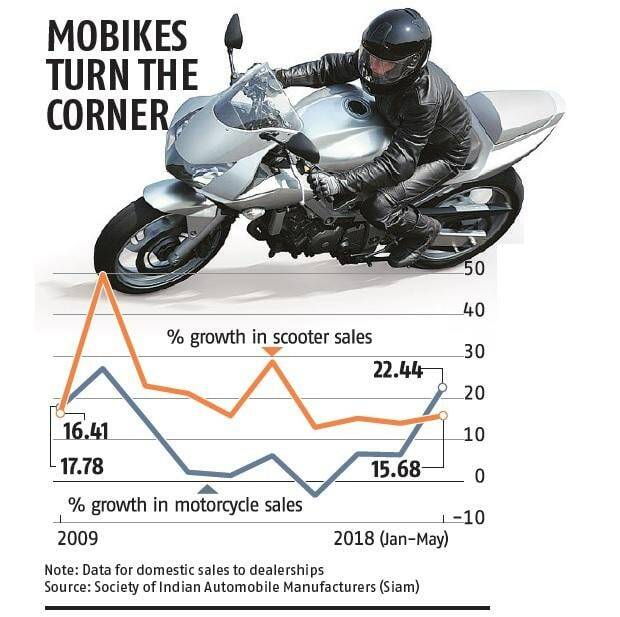 A strong comeback in the demand for motorcycles has a direct positive impact on the fortunes of two leading listed two-wheeler makers: Hero MotoCorp and Bajaj Auto. Hero, the biggest player in the domestic two-wheeler market, gets about 88 per cent of its sales from motorcycles, while the rest comes from scooters. In the case of Bajaj Auto, its entire domestic two-wheeler volume comes from motorcycles as it does not make scooters. Both these companies are clocking double-digit growth in domestic motorcycle sales in recent months. While the current growth leading position of motorcycles is based on the data for the first five months, demand is expected to get a further boost after the kharif crop harvest around September-October, which also coincides with the festive season. “With the forecast of a good monsoon this year, there is expectation of an uptick in market demand in the later part of the year. This will lead to a sustained momentum in the positive turnaround in sentiments across the country,” said a Hero MotoCorp spokesperson. This will be the third consecutive year of a normal monsoon and even though there has been surplus and price pressure in certain farm products, the sales growth in motorcycles and even tractors points to an intact demand from rural markets. Half of the domestic motorcycle sale is estimated to come from rural buyers and Hero has a 51 per cent share in the overall motorcycle market. While this trend of a stronger demand for motorcycles (which have a base double to scooters) augurs well for some players, it may not be great news for companies relying heavily on scooters. Japanese auto major Honda Motorcycle and Scooter India (HMSI) gets two-third of its domestic sales from scooters. Y S Guleria, senior vice-president (sales and marketing) at HMSI said the first quarter (Q1) typically has a lot of seasonality attached, with the monsoon and marriage season pushing up the sales momentum for motorcycles, while scooters growth accelerates starting June. But Q1 data of 2017-18 did not show this seasonality when scooters grew 20 per cent and motorcycles just 3.44 per cent. Guleria admits that the rural demand is ‘reviving’. “Motorcycles account for nearly 80 per cent of the two-wheeler industry in Uttar Pradesh, Bihar, and Rajasthan. Since these three states bring 30 per cent of national motorcycle sales, a seasonal impact in these markets will always impact the overall industry. However, the scooter growth story is also strong,” he said. Unlike motorcycles, scooters are largely an urban product and therefore, in years when the former came under pressure due to challenges in rural economy, growth in scooters continued. “Scooter penetration is low in some geographies, but demand is now growing exponentially,” said Guleria, adding it will continue to see double-digit growth. Some in the industry, however, maintain that scooters have faced pressure due to a rise in petrol prices. 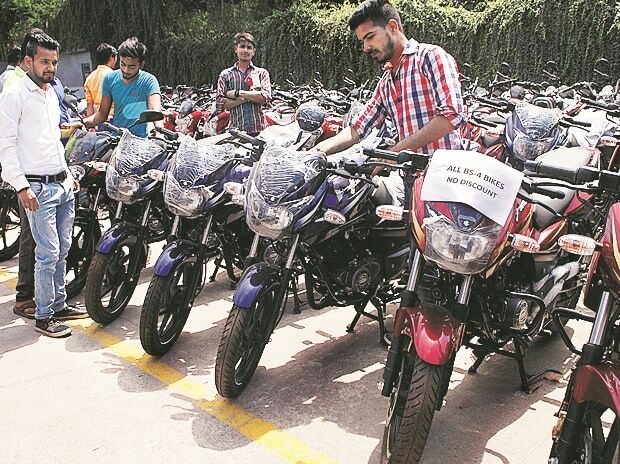 Motorcycles offer 25-30 per cent higher fuel efficiency, against scooters and therefore, in the event of a continuous hike in petrol price, there is shift in demand patterns. The change is evident in the fact that in two of the last three months the most sold two-wheeler was the Hero Splendor motorcycle, followed by Honda Activa scooter. Activa had been dominating the top position for months together until the recent change in the pecking order. Binaifer Jehani, research director at CRISIL, said the rural demand is lending support to motorcycles. “The motorcycle segment is picking up. Expectations of normal monsoon is also enabling an upswing in sales. The recently concluded marriage season has also added to the demand. Urban demand is also growing, albeit at a slower pace”.